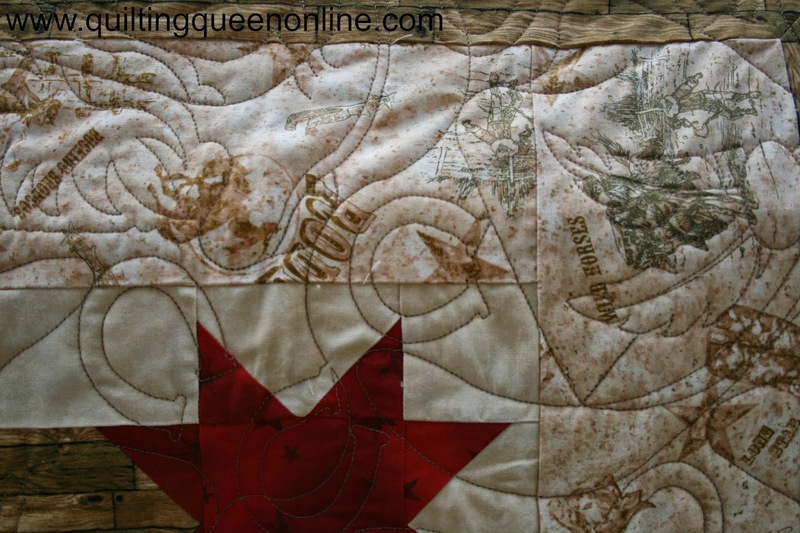 I've been quilting fast and furious and I have lots of quilting to show you. I'll just show you a few at a time so the post won't be so long. Queenie has been working overtime and decided a day or two ago that enough was enough. I don't know what made the bobbin assembly do this but it just fell out of it's place right in the middle of quilting. I'd been rockin' and rollin' along just fine and then bam! It made one heck of a clatter and bang. Me, being the optomistic person that I am decided that was a fluke and so I proceeded to put it back in order and quilt again. Haha! Silly me. 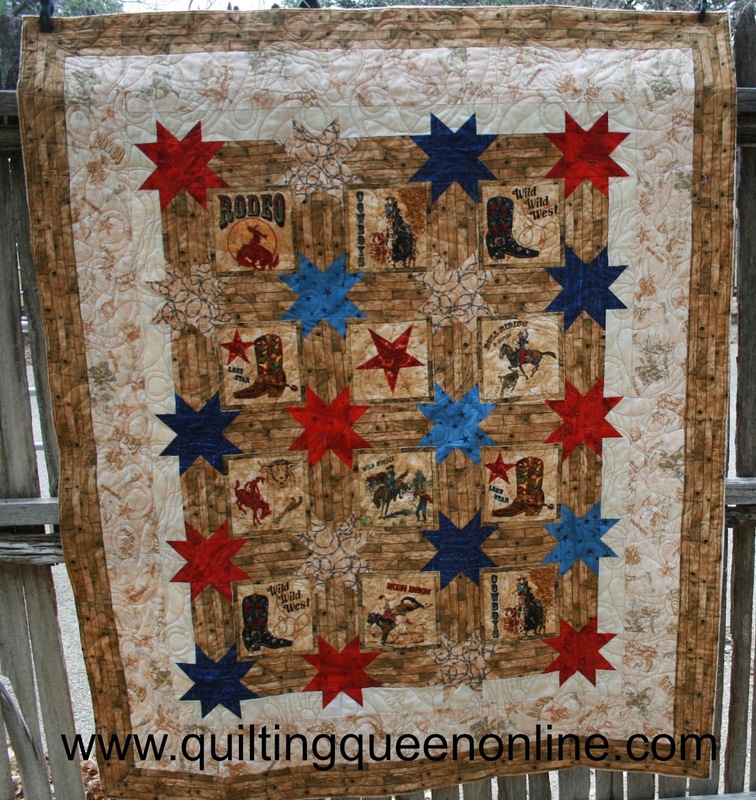 Queenie quilted for a very short distance and bam! She did it again. Of course, when it did this, it threw the timing off on Queenie and I had one heck of a time getting it set back right. 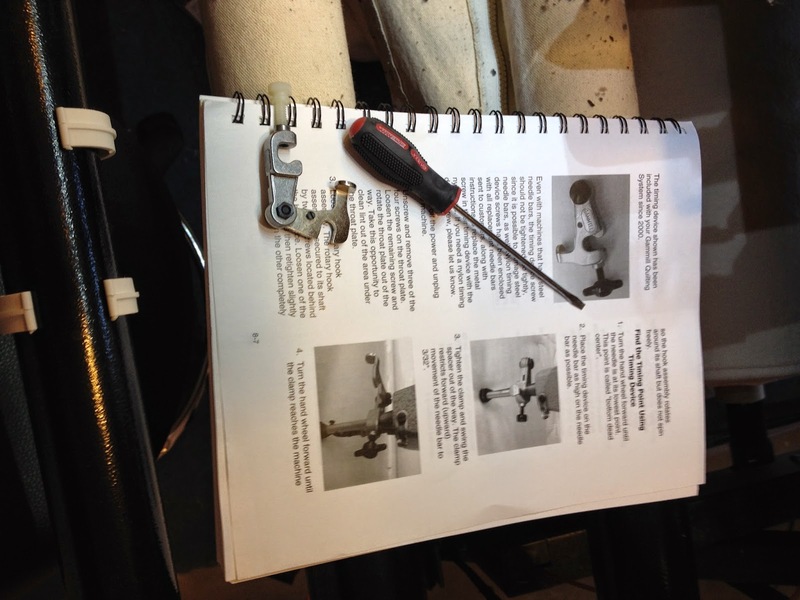 It's never a good thing when a repair manual, a timing tool, and a screw driver are involved. The King came home and took one look and went "OH NO" and turned back around and went straight to the house. Boy, he was sure a lot of help! He knew it was probably best to just stay the heck out of my way. He did fix supper and a much needed cocktail for me. I got the timing adjusted and Queenie working again (before the cocktail was comsumed)! Carolyn from Baird, TX made this for her church for a fund raiser. She said the blocks were blocks she won in a block exchange several years ago. She also reports that the quilt brought a nice amount of money for the church. I quilted an edge to edge pattern of hats, boots, and horseshoes using tan Mother Goose thread. Dee from Richards MO made this scrappy churdash block from her scraps and says it will make a nice utility quilt for a bed. It is a big quilt. 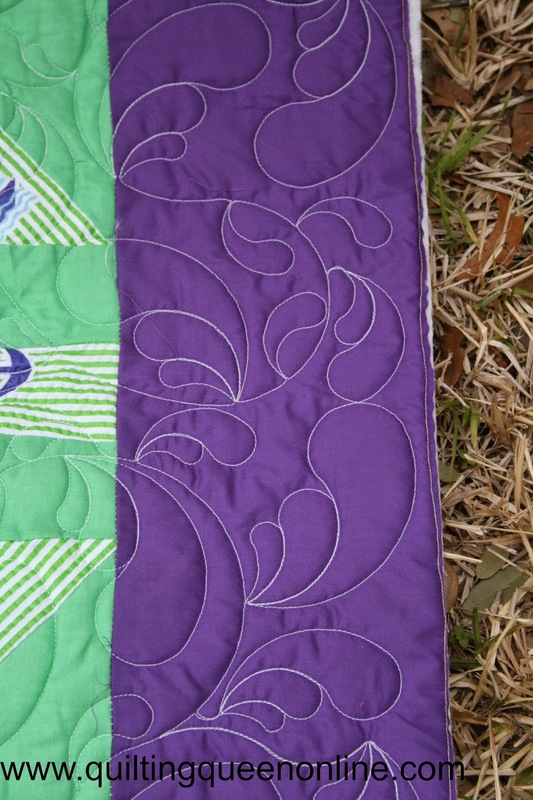 I quilted meandering feathers in white thread. 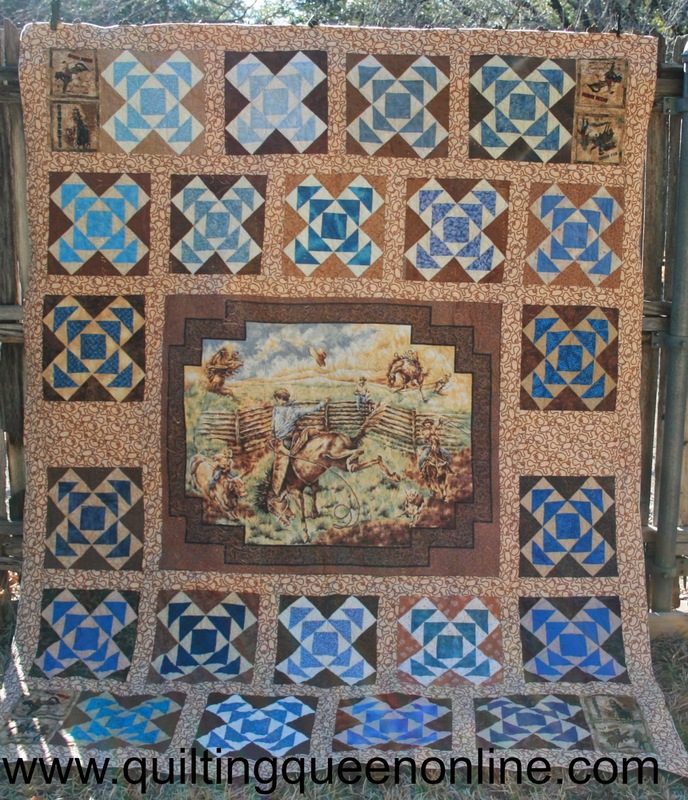 Bobbie from Proctor TX made this western quilt for a relative who's home is decorated in Western decor. She and her husband are both "cowboys" and their two little ones are growing up to be "cowboys" too. I quilted hats, boots, and horseshoes in Mother Goose thread on this one also. 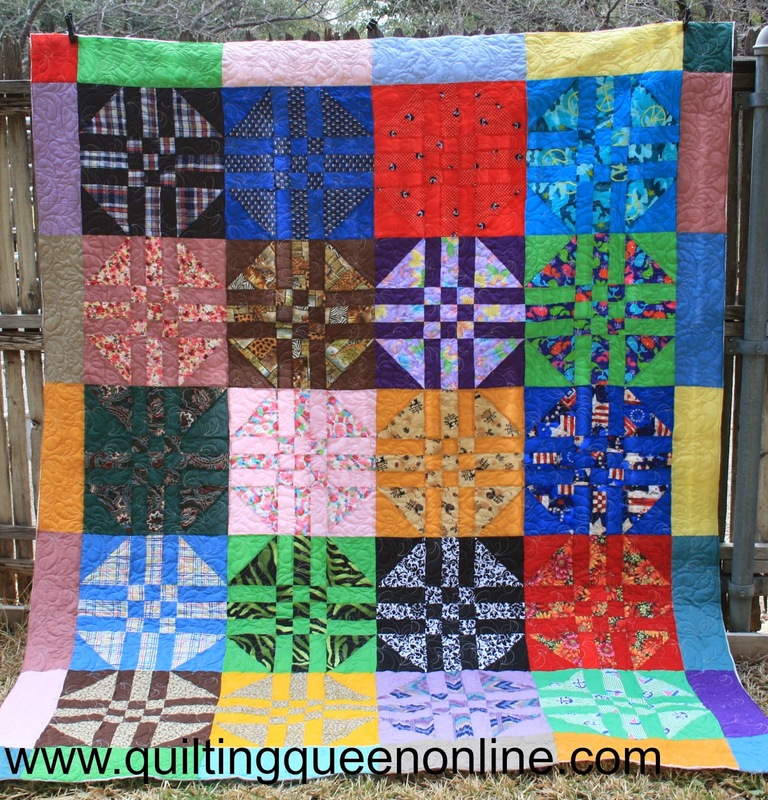 You are a pretty awesome quilter! Love the Cowboy motifes!